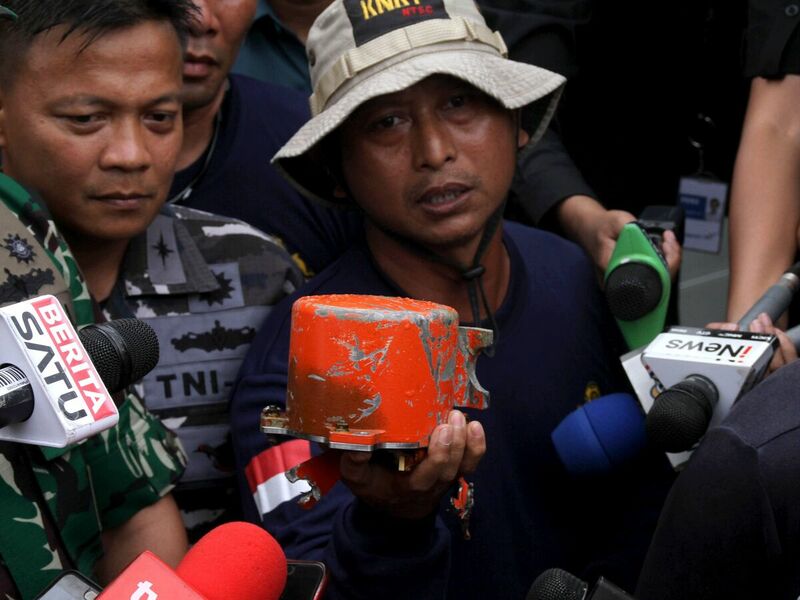 Lion Air Crash: Cockpit Voice Recorder Recovered The "black box" may provide insight into what happened in the minutes before the Boeing 737 MAX 8 plunged into the Java Sea, killing all 189 people aboard. Divers from the Indonesian navy have recovered the second "black box" from the Lion Air jet that fell into the Java Sea in October. The cockpit voice recorder could provide information on what caused the crash, which killed all 189 people on board. The device, which is actually bright orange, was found buried 26 feet deep in mud through the use of a "ping locator," the Associated Press reports. "This is good news, especially for us who lost our loved ones," Irianto, the father of a doctor who died in the crash, told the news service. "Even though we don't yet know the contents of the CVR, this is some relief from our despair." Officials said the voice recorder was found not far from where the flight data recorder was recovered days after the crash. Investigators say some human remains from the crash also were found. Time was of the essence in locating the voice recorder, as its acoustic beacon was designed to ping its location for 90 days after a crash, Rear Adm. Harjo Susmoro told reporters — meaning that in about two weeks it would have become much harder to find. Haryo Satmiko, deputy chief of Indonesia's National Transportation Safety Committee, told Reuters that in the past it has taken up to three months to download and analyze the contents of such voice recorders. "We don't know what damage there is, but it has obvious scratches on it," Navy Lt. Col. Agung Nugroho told the news service. Images of the device showed scratches on its orange paint, but no major damage. Lion Air Flight 610 plunged into the sea just 13 minutes after taking off from Jakarta on Oct. 29. It was the first crash of a Boeing 737 MAX 8. Lion Air, a low-cost airline serving Southeast Asia, signed a commitment with Boeing for 201 of the jets back in 2012 — part of a huge deal with a list price of $21.7 billion. The new plane had been in use by the airline for only a few months when it crashed. The relationship between Lion Air and Boeing has frayed considerably since the crash. In late November, Indonesia's National Transportation Safety Committee released a preliminary report on the crash using preliminary data culled from Flight 610's flight data recorder. "According to the report, a sensor falsely signaled that the jet's nose was too high. An automated Boeing anti-stall system pushed the nose down, while pilots tried to use their controls to bring it back up," as NPR's Emily Sullivan has reported. "Data showed the 737's pilots managed to pull the jet's nose back a total of 26 times from takeoff until its plummet into the sea in what [expert Peter] Lemme has called a 'deadly game of tag.' "
However, the committee said at the time it was too early to declare a cause of the crash and that it had not yet decided whether the anti-stall system, called the "maneuvering characteristics augmentation system," was a contributing factor. Boeing has since sent updates that re-emphasize "existing procedures" for how pilots can manually override the system, as NPR's David Schaper has reported. Following the report, Boeing released a statement that seemed to raise questions about Lion Air's maintenance and safety procedures on the airliner, as the aircraft had encountered problems related to airspeed and altitude over the three days prior to the crash but that pilots on earlier flights had been able to land safely. Lion Air co-founder Rusdi Kirana has said he is "very disappointed with the way Boeing has behaved" and has discussed canceling the rest of the order for Boeing planes, most of which have yet to be delivered. As Bloomberg reports: "According to Kirana, Boeing has yet to deliver about 250 jets to Lion Air. The manufacturer's orders and deliveries website shows 188 unfilled orders." Reuters reports that relatives of people who died on Flight 610 have filed at least three lawsuits against Boeing. Among them is a lawsuit filed by the family of one of the pilots, who allege that "aircraft sensors provided inaccurate information, causing the plane to nosedive, and that Boeing failed to provide proper training to pilots on the 737 MAX 8′s features," AP reports.